The tour continues. 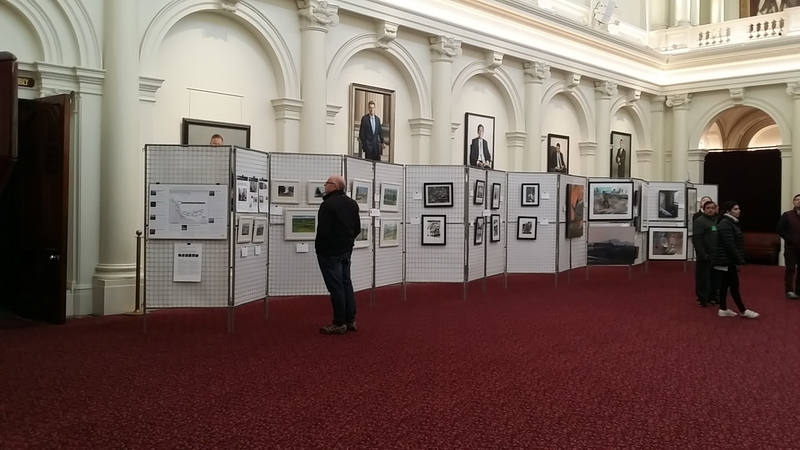 As we worked our way through security with all our paintings, labels, posters and bulldog clips; I wondered what Mei Ling would have thought of arriving in the Queens Hall, in the Victorian Parliament House? Through to the Green Room where all the action is. Mei Ling would probably laugh and introduce herself to people. So that is what we did. We met the Premier, cabinet ministers, visitors to our art exhibition and hundreds of school students. 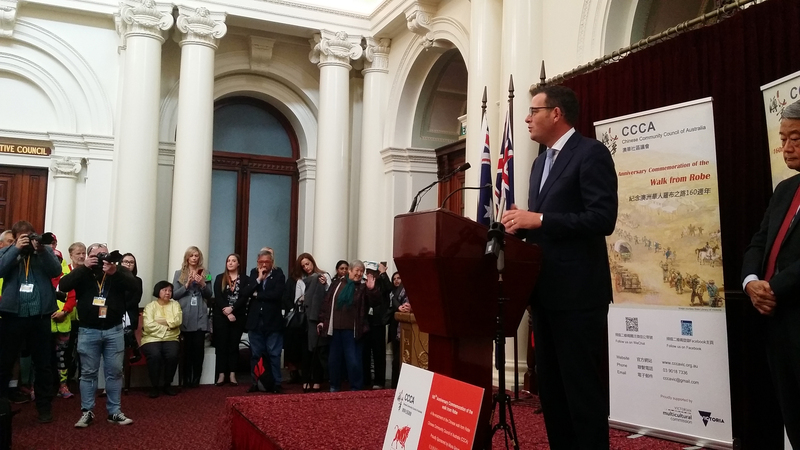 We were here back in May 2017 when Premier Daniel Andrews formally apologized to the Chinese community for the terrible treatment they received in the Gold Rush era. Premier Daniel Andrews and the Honourable Hong Lim at the formal apology ceremony, Queens Hall. By then we knew just about everyone in the room. Our travels had taken us from a simple mother-daughter holiday to Robe (to paint) that quickly turned into a whirlwind of community engagement that swept us along for 18 months to arrive here in Queens Hall. YouTube, instagram, Facebook, WeChat, invitations to be artists in residence, talk at conferences, a radio interview and an ABC article. One thing just led to another. Somehow our pictures resonate strongly with this community. I really feel like a citizen of Victoria. When you sit in Parliament and listen (after you recover from your initial shock at the boisterous behaviours) you realize how connected we all are. These men and women are really trying to represent us. I know we all like to bag our politicians but go along and listen to the issues they are dealing with on our behalf. You’ll see. There are a lot of stories out there. Some of them bubble up when they involve a lot of people. If you are a painter, or a poet, a film maker, writer — use your talents and skills to tell a story that involves a lot of people and you will have your day in Parliament. 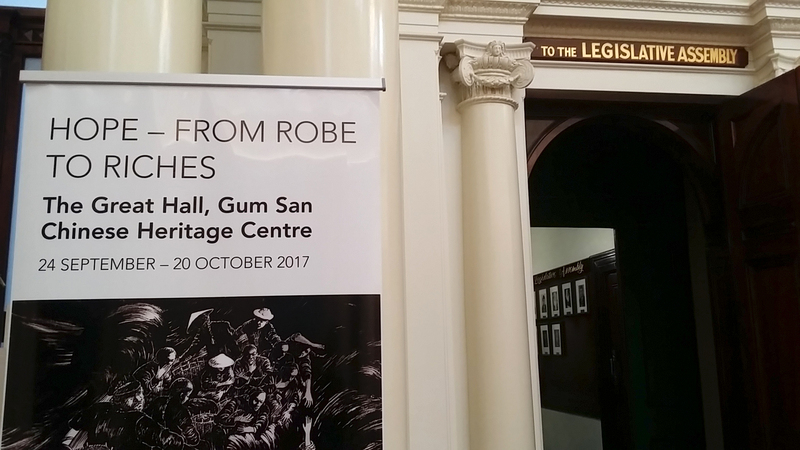 Thank you to the Parliamentary Secretary for Multicultural Affairs and Asia Engagement Chinese Mr Hong Lim and the Community Council of Australia for inviting Hope: From Robe to Riches Art Exhibition to be on display at Queens Hall, Parliment House in July 2018. Previous What is the value of the Hope: From Robe to Riches Art Exhibition?